The site development structure proposes a block-like spatial development that permits routes across the lots. Despite the large building volume, this idea was taken up and, even at the macro level, the Augsburg Center of Technology (TZA) was networked with the neighbouring university buildings and research institutes. Two almost equilateral building volumes are aligned horizontally, picking up both formally and dimensionally on the structure of surrounding development. Similarly, the principle of local height increases was continued. The different orientation of the volumes generates two dissimilar urban development spaces. 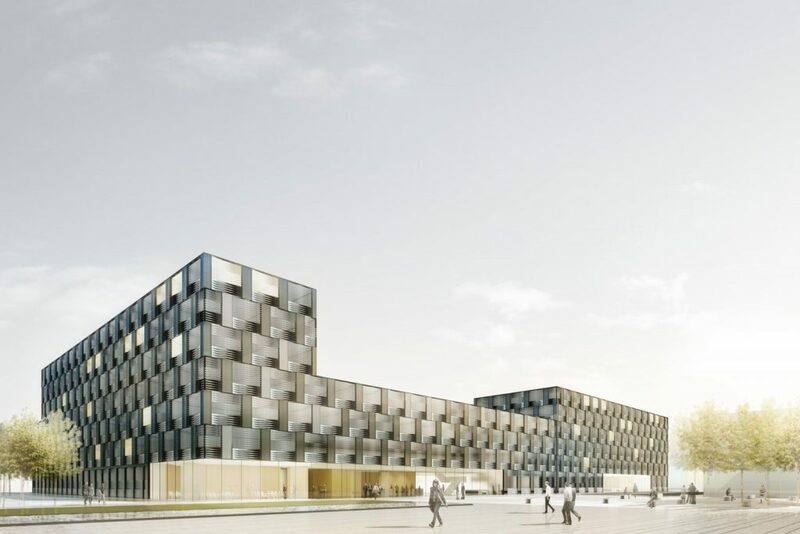 Both building volumes are conceived as modules: a hall and an office block. The modular principle continues in the hall, offering maximum flexibility and easy adaptation to diverse and changing requirements. The façade is composed of window elements with external lamella that rotate about their central axis. This makes the lamella look like fibres that reflect the light differently, depending on their orientation. They give the façade the character of a woven fabric.